Picture on the left was a week ago today and on the right is today. Showing great signs of recovery and the larger verti-drain holes will close up next week, theses are left unfilled so when we have heavy rain during the summer the greens will drain quickly. Hopefully next week we will see some of the new bent seed starting grow. 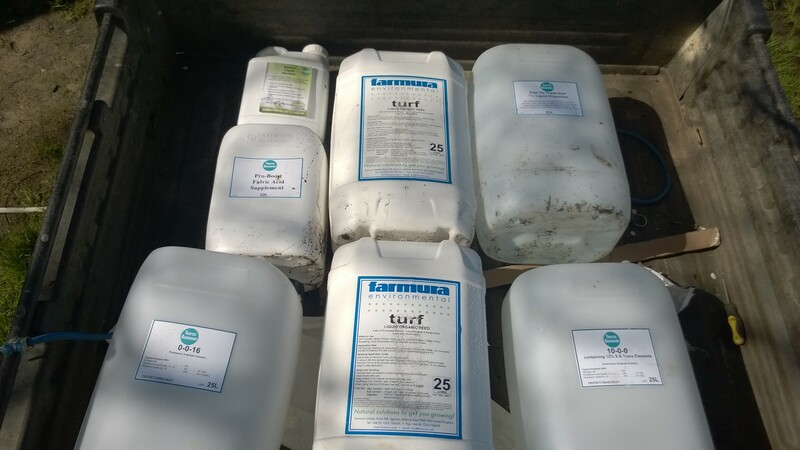 A little nutrient and bio stimulants to help speed up recovery but to much will encourage disease. Then a fungal dominant compost tea brew sprayed on the greens to degrade thatch and improve soil biology then a rebrew with bacteria which reduce disease and unlock nutrients so they are readily available for the plant. During this dry spell we have irrigated the the greens this week with 24mm of water to help recovery, improve germination of the bent seed and to wash in nutrient/bio stimulants and fungal/bacteria compost tea brews. Overseeding on the greens during renovation week has finally made appearance. Click on the link to see what we use on our greens. 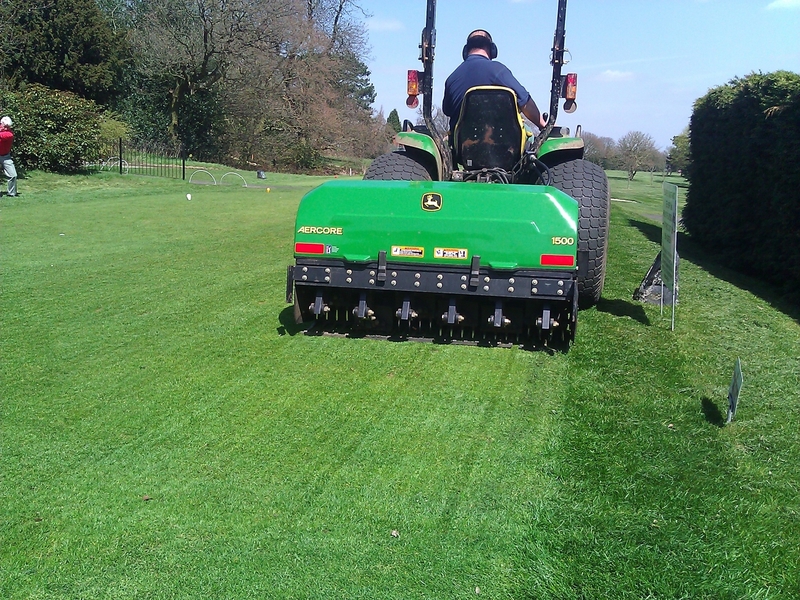 Renovation week will consist of hollow tining the greens with 8mm hollow tines down to a depth of 2″ then dressed with 30 tons of Ruffords no3 topdressing while Verti-draining down to 7″. ◾Monday: Verti-cut and hollow tining greens with possible 3 temporary greens in place. 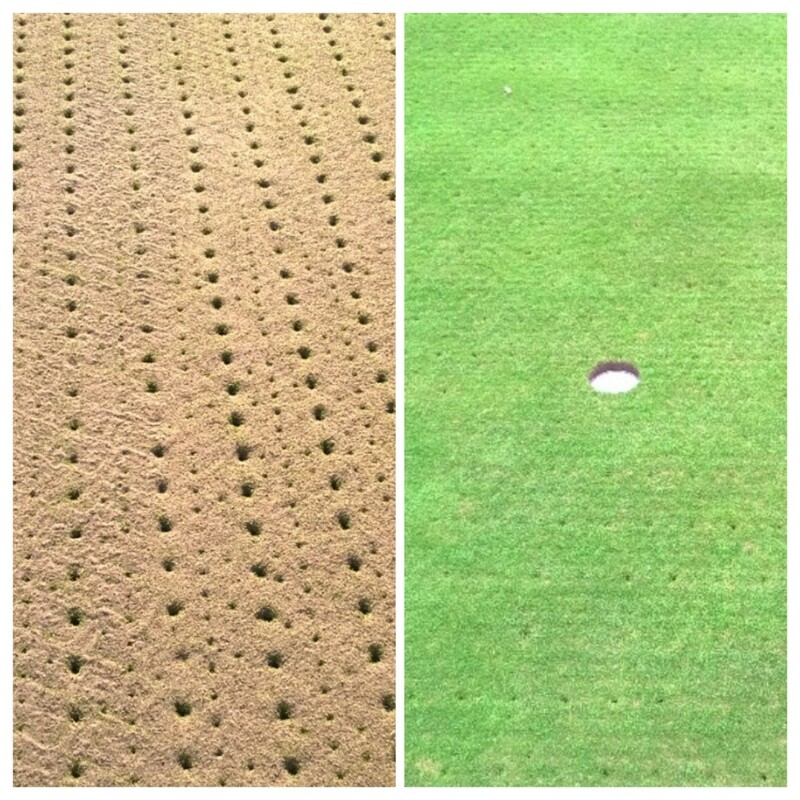 ◾Tuesday: Hollow tining greens then verti-draining will commence with possible 3 temporary greens in place. ◾Wednesday: Verti-draining greens and topdressing applied and brushed in, 2 temporary greens in place. ◾Thursday: Topdressing applied and brushed in, 2 temporary greens in place. Weather forecast looks good so I’m hoping for not too many delays. 10 greens hollow tined on Monday. 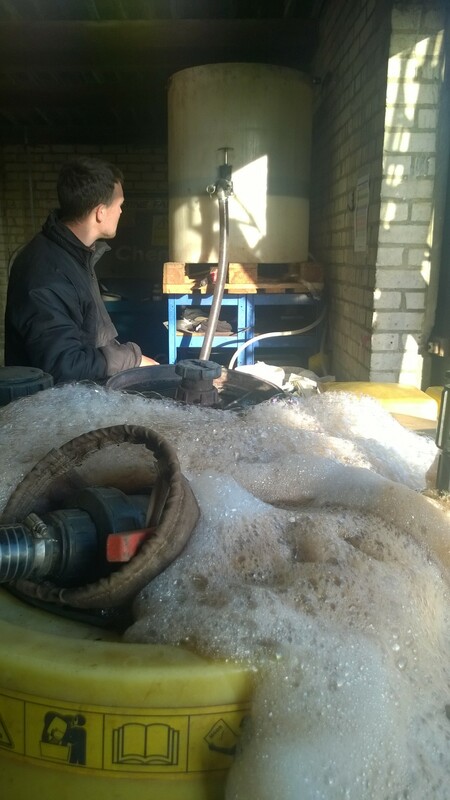 Spray of seaweed, liquid fish, iron, 25lt 16.3.18Te and Mn applied to speed up recovery and strengthen the plant. Saturday morning after yesterdays rain. First cut will on Sunday. 2 weeks later, seed germination. Over the next couple of days I will be inspecting the greens soil profile for thatch build up and consistency. I have already made plans to carry out the same work as we did in the spring renovation. The idea is to achieve consistency over all 20 greens and this can only be achieved by treating them differently as they all behave in different ways. 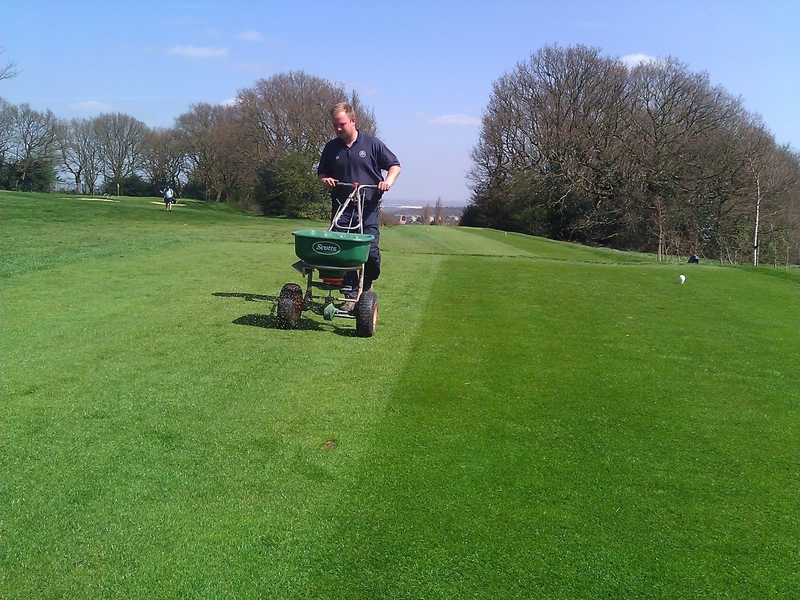 Throughout the year all the greens receive different quantities of fertiliser’s and topdressing so the consistency can be achieved, if you get this wrong then the greens will be noticeable different in there performance ie green speed, firmness and roll. Next week we may alter the depth we hollow tine which depends on the depth of thatch/fibre we have accumulated. 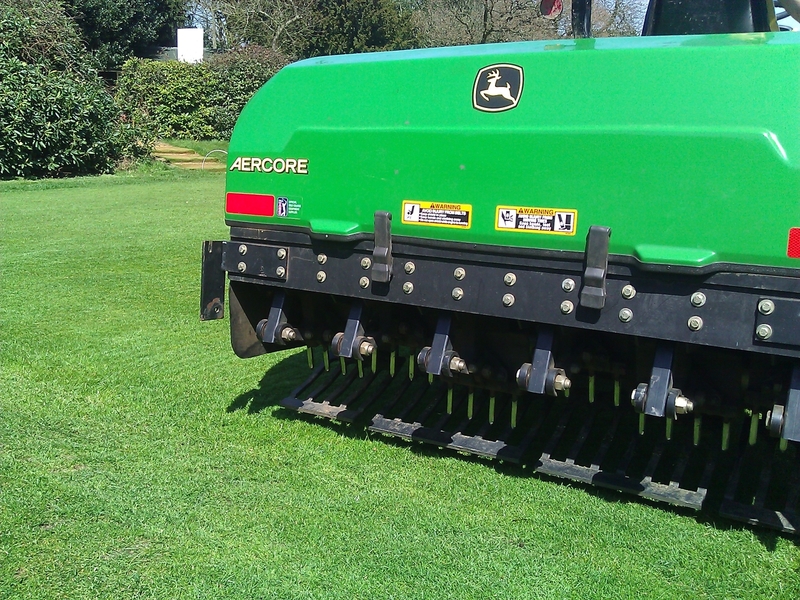 Tees will have their renovation this week and will involve large tining with 19mm diameter tines down to 3″ depth with over seeding with 60kg of Dwarf Ryegrass with 30ton of topdressing. Renovation week Monday 15th April to Thursday 18th April 2013. 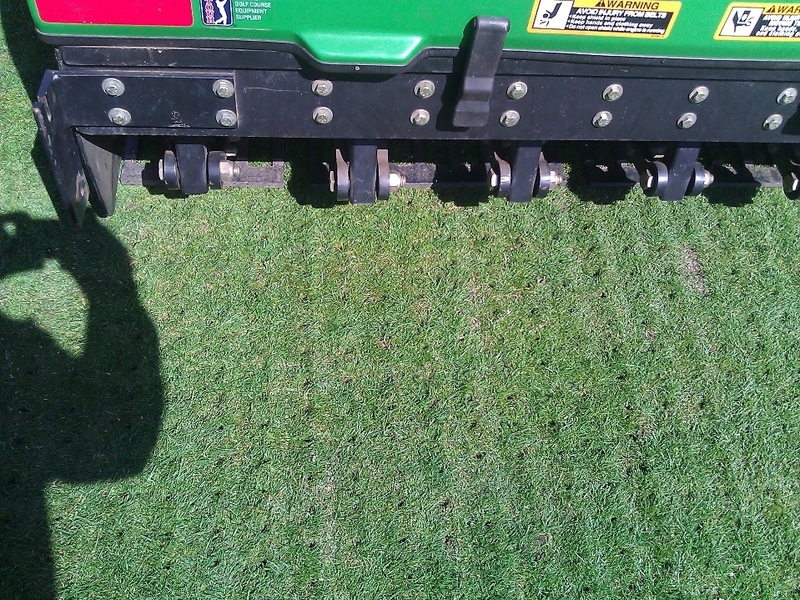 Monday: Verti-cut and hollow tining greens with possible 3 temporary greens in place. Tuesday: Hollow tining greens then verti-draining will commence with possible 3 temporary greens in place. Wednesday: Verti-draining greens and topdressing applied and brushed in, 2 temporary greens in place. Thursday: Verti-draining greens and topdressing applied and brushed in, 2 temporary greens in place. Friday: Course presentation and final brush on the greens. The reasons for this essential work is to keep the greens in good condition and playable for most of the year. 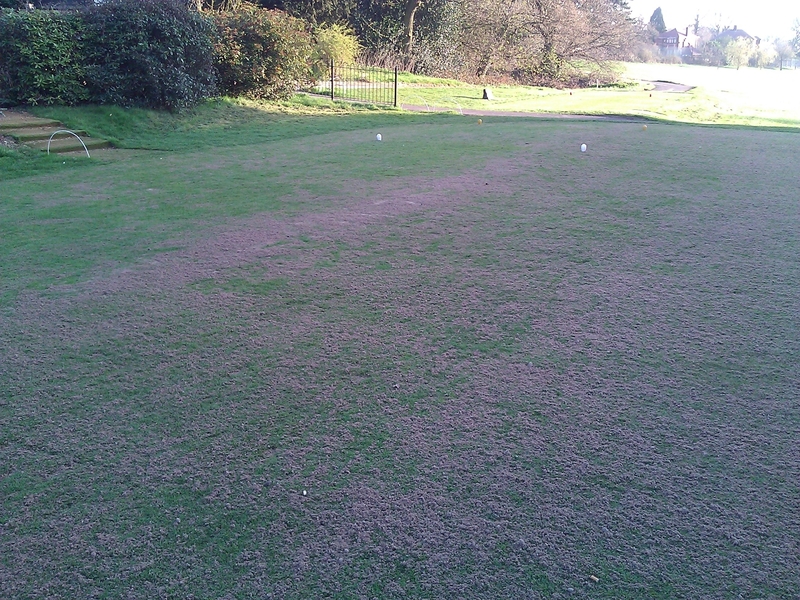 The last year has been a great test for our greens and I think you all would agree they have performed well with no temporary greens or disease out breaks, this is a testament to the plan that was implemented way back in April 2003 when I took up the position here at Shooters Hill Golf Club. 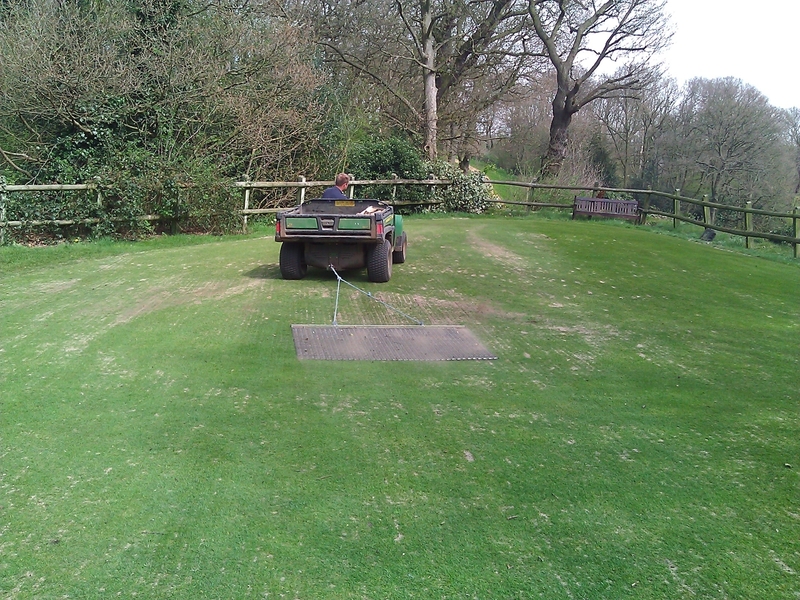 Since then 4″ of thatch has been removed and replaced with 3″ (890 tons) of the most suitable topdressing available in the UK. The easiest thing to do now would be “nothing” but that would be the wrong thing to do unless we want to go back to soft, slow, bumpy, diseased scarred and temporary greens. The most difficult job now is to keep them this way with the least amount of disruption to play and keeping thatch from increasing. The work above is the least we can do for now and will take up to 2 weeks to recover weather permitting and will reduce thatch, help surface water percolation while keeping the surface firm and true for play this summer. Photos will be published on here through out the week to keep you informed of the progress.